Good news. I finally managed to pass the N2 of Japanese Language Proficiency Test (JLPT). This was my second attempt. The first attempt went down horribly. This was also my last shot at it, so I am glad I could pass it. The exam has several sections, namely Language Knowledge, Reading and Listening. We have to get 19/60 for every part at least to pass the exam. 57/180 doesn’t look that hard but you actually have to score 90/180 a well. The last time I only managed 79/180 and the biggest contributor to the failure was the reading part. I am too slow at reading Although I had the required marks for the Language Knowledge section, I had a bad start to the exam with not knowing answers to first five questions. To be honest, I didn’t study much the first time. I thought the Japanese knowledge that I have gained by working in Japan amongst Japanese people was enough to pass the exam. Obviously I was wrong. So this time I studied a bit more. The biggest issue I had was that I could not find a proper syllabus for N2. So how did I study? I didn’t buy any books and definitely didn’t attend any classes. 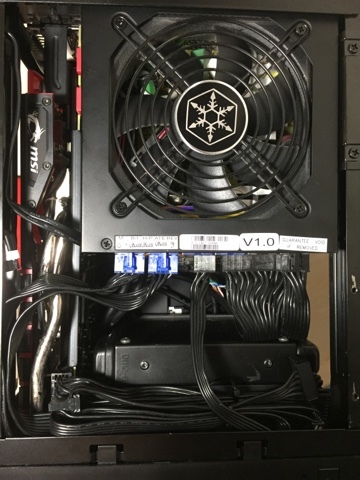 Now that I have cancelled the order for the Silverstone SX500-LG PSU, I thought of tidying up the cables of my current PSU to make room for the air to flow without obstruction from the front intake fan. The PSU that I currently use is also from Silverstone, but it is an ATX PSU which has cables that are long enough to approach the components when installed in a larger case. It is impossible to find an ATX PSU with short cables for that reason, but compared to the other brands, the cables that come with this PSU are a tad shorter. However there are some stupid design decisions that have been made by Silverstone such as having only one connector on each PCI-E cable. So, not only the cables are too long for the SG13 case, I have to use more cables than necessary. But I wanted to see what I could do about that cable mess. As far as I know, things would not get any worse than this as the PSU that I plan to buy a will have shorter cables. This is what I was able to achieve. Couple of days ago I posted on Facebook how I chickened out from delidding my Devil's Canyon chip. A friend told me that it would be beneficial for me to upgrade to Haswell-E instead. Haswell-E die is soldered to the IHS so it shouldn't run at a temperature as high as Devil's Canyon. And I get at least two more cores to play with. I checked the prices of the Core i7 5820K (because the 5930K is useless and the 5960X is out of reach), ASRock X99E-ITX/ac Mini-ITX motherboard (the only X99 Mini-ITX board out there) and 16GB of DDR4 2666 sticks. That would total out to around JPY 105,000. Expensive, but that’s what you have to pay for cutting edge. But it all depends on how much I can make from selling my existing stuff. I checked the offers on Sofmap store and it was disappointing. Very disappointing. I would only receive around JPY 50,000 in total for my Core i7 4790K CPU, Asus Z97i-Plus board and A-DATA DDR3-2400 16GB memory. That’s an insanely low amount. No way I am going to sell my stuff to these shops. However, shops aren’t the only place I can sell them. I can auction them online. However, since these are all used parts, I bet I won’t be able to extend this to JPY 70,000 mark. JPY 60,000 is possible, but it will take a long time because I have three components to sell. And if I sell at least one of them, I would have passed the point of no return. We take a lot of photos when you go on trips. (Otherwise what is the point of buying the Canon 70D?) My wife loves to sort them out in the next couple of days. Since she takes a long time, I do not want her to use the desktop PC for that. I used to setup the tablet to access the photos which are stored on the hard drives in the desktop PC over the network, but we no longer have a tablet with us. We visited Sanrio Puroland last Monday. As usual, my wife wanted to check out the photos we took there and this time I setup the MacBook Air for her. Unfortunately, the built-in Preview application can open only one photo at a time. You cannot use the arrow keys on the keyboard to navigate between the photos. There is no provision for that in that application. So as a temporary measure, I copied all the photos to the MacBook and imported them into the Photos app in OSX Yosemite where she could use the arrow keys to navigate. What if I had Windows on the MacBook Air? In fact, I had an early preview build of Windows 10 (build 10041) already installed using Boot Camp. I booted into it and immediately felt how unstable it was. I tried using Windows Update to see if I could upgrade it to the RTM build. Windows Update insisted that there weren’t any pending updates. Windows Update was broken! Either the Windows Update in this build was broken or Microsoft didn’t want it to be upgraded to RTM. I first went into OSX and removed the existing Boot Camp partition. Then I downloaded the Windows 7 Pro ISO that I had stored on my desktop PC onto the MacBook Air. I fetched one of my 16GB SANDISK USB sticks (click here to read a small review of them) and started creating the Windows 7 bootable installer from Boot Camp Assistant. I partitioned the SSD in the MacBook 50%-50%. I really don’t keep much files on the drive so I could survive easily with 60GB on each OS. Once that was done, I rebooted the MacBook and the installation of Windows 7 started. Installation of Windows 7 went without any drama. After the installation was completed, Boot Camp installed the required drivers and I finally could go online to activate Windows 7. When I migrated my PC into the Silverstone SG13 case, I mentioned that I had a few future upgrades planned. It was mainly two things: a SFX PSU and a better cooler. I have ordered the PSU already, although it has not arrived yet. The cooler was a low priority one, because I already had an ancient AIO water cooling unit, namely the Antec Kuhler 620. So why did I want a better cooler? It is because the Kuhler 620 was showing its age. The CPU temps rise past 90C when I run Asus Realbench stress test on my Devil's Canyon CPU clocked at 4.5GHz at 1.24V. Neither Realbench is as stressful as Prime95 or Linpack nor the Vcore is on the high side, but the temps are too high. To make things worse, the fan I use - the Gentle Typhoon AP29 - is much more powerful than the fan that came with the cooler. I asked around if the performance I see is what I should get from this particular cooler, and people say it should perform better. Some said it is possible that a portion of the coolant has evaporated over the years. Even though it is a sealed unit, there could be micro sized holes than could be responsible for such a thing. All I know is, it is not performing up to my expectations. So I looked around for a replacement and came across three candidates suitable for the job. The NZXT Kraken x31, Corsair H80i and the Fractal Design Kelvin T12. All of them were similarly priced and they all had their pros and cons. However after some thought, I rejected them all. They all added extra weight to the PC. The H80i with the thicket rad with dual fans (yes, it fits marginally), the T12 with thicker rad and the Kraken with dual fans. I would probably buy a new cooler once the weight reduction has served its purpose. But is there anything else that I can do? Yes indeed there is. Delidding the CPU. That would result in an instant 15C reduction in load temps. And it would cost much less than a new CPU cooler.